methodical aproach to defeat Lawrence. LJWorld. Leavenworth managed two early touchdowns, then held on for the victory. The Pioneers struck first on a five-yard touchdown run from Jason Randall at the 4:51 mark in the first quarter to go up 7-0. Later, with 1:10 left, Leavenworth capped another drive with a five-yard touchdown run from Isaiah Ross to go up 13-0. As time expired in the half Leavenworth tacked on a field goal from Jake Boyce to extend the lead to 16-0. LHS' only score came in the third quarter on a 43-yard touchdown run from Drew Green. Free State won their 100th game in program history Friday night in blowout fashion. They fell behind 6-0 early on when Dimonic McKinzy hit Steven Ford on a six-yard touchdown pass, but it was all Firebirds after that. Fifty-five points straight, that is. Joe Dineen rushed for two touchdowns and threw for two more, while Carson Bowen notched two touchdowns of his own. SM Northwest took advantage of two early SM East fumbles to jump out to an early lead, but then the Lancers' engine heated up and they scored 35 straight to close out the game. Jake Horner returned an early fumbled 64 yards to give the Cougars a 7-0 lead, before Laphonso McKinnis took a touchdown carry in from two-yards out later following another SM East fumble. But SM East took over in the second quarter. Christian Blessen first found Mitchell Tyler on a 79-yard touchdown pass. Next, Micah Dodson capped a drive with a one-yard touchdown run. A Tyler touchdown run just before half made it 21-13, SM East. The scoring began in the third quarter on a short run from Luke Taylor, and another touchdown run later in the quarter from Dodson put things out of reach. Olathe North's smothering defense and smash-mouth rushing attack were enough in this game, despite the Eagles committing 130 yards worth of penalties. The scoring began when a Marcel Spears interception set up an short touchdown run from Venus Triplett. Olathe Northwest put together a solid drive and answered with an 18-yard touchdown pass from Cole Dahlquist to Cody Sestrich to tie the game at 7. Triplett took a carry 75 yards for a touchdown on the next Olathe North possession to give the Eagles the lead once again, which they carried to halftime. Early in the third quarter Spears picked off another pass, which set up a Triplett touchdown run several play later, making the game 21-7, Olathe North. Later in the quarter Cole Murphy found Mauricio Chio on a 30-yard touchdown pass to make things 27-7. The final score of the night came on a 74-yard touchdown run from Triplett in the fourth quarter. On Olathe East's first play from scrimmage running back Jordan Brown scored on a 27-yard touchdown run, setting the tone for the game. Later in the quarter Connor Leach found Branden Trinkle on a six-yard touchdown pass to go up 14-0. Brown would add another touchdown run, from one yard out, and Leach connected with Braxton Love on a 27-yard touchdown pass to give the Hawks a 28-7 halftime advantage. Olathe East came out hot in the second half as well, scoring first on a 60-yard touchdown pass from Chase Miller to Connor Alexander to push the lead to 35-7. Two more Brown touchdown runs of 55 and 60 yards gave the Hawks a 49-7 lead in the fourth quarter. A 35-yard interception return for a touchdown by Trinkle gave Olathe East their final score of the night. A 43-yard touchdown run from Gardner-Edgerton's Traevohn Wrench set the tone for what proved to be a long, rainy and dreary evening for Olathe South. 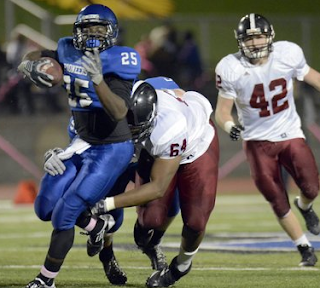 Wrench went on to score six touchdowns, rushing for 239 yards on 24 carries. SM South jumped out to a 7-0 lead on a seven-yard touchdown run from Chase Allen but in the end they missed on too many scoring opportunities. BV Northwest was able to tie the game before the half, and then take over in the third quarter. The Huskies went ahead 14-7 early in the second half, before a Christian Kelley field goal pulled SM South to within four at 14-10. From there, BV Northwest scored three unanswered touchdowns to claim the victory. It took seven games, but SM West finally came away with a blowout victory. The Vikings managed 333 rushing yards and six rushing touchdowns, while quarterback AJ Verdini completed eight of his nine passes for 217 yards and two touchdowns. SM West led 35-7 at halftime. SM North managed to make up some late ground on several long touchdown passes from Will Schneider to Nick Perez. I wanted to drop by and say I've kept away from this blog for the past two weeks because I am still absolutely sick and heartbroken over the tragic death of SMW player Andre Maloney. That hit hard for me for personal reasons, as my son also died at a very early age. I wish that pain on no one. I feel so bad for his family and the West team and coaches, and for the students and everyone who knew him. I went to the game and sat with West fans and I was so impressed (albeit in tears) for most of the night when they honored Andre. There is so much support and love and respect for one of the best players the SFL has ever seen, and I am already missing seeing him play. My heart then rebroken when lineman Carter Pembridge went down, and I read somewhere he tore his ACL. In my opinion he was the best offensive lineman on the field for West, smart player with size, vision and mobility. He is a great pulling lineman, never saw a kid wrap so well. O-Line is such an underrated position and when I see a good offensive linemen, I love to see how he affects the game. Prayers for a speedy recovery for him and prayers to his family while they deal with this on top of the circumstances with Andre. If anyone at all has any news on that kid, I for one would really appreciate any updates, or is that not PC on amateur sports message boards? Hope the kid comes back stronger next year, from my understanding he's only 16 or 17, or a junior. The fact that those players even took the field and finished the game was a victory, I still tear up thinking of it. Hats off to the other schools who sent out their sympathies and love for Andre. Very classy and I am sure much appreciated by Coach C and the Vikes. 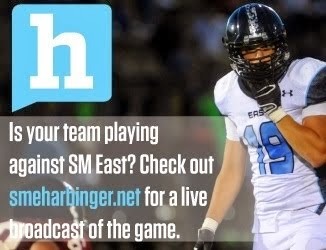 I can't seem to get into these games much, but I will definitely be watching East this week. I believe they have all the talent necessary to win State this year, and they are definitely on a roll. Congratulations to all teams on their performances and I wish you all luck this upcoming week. I hope you all have fun playing and remain injury free for the rest of the season. That was a nice post Victor, I'm sure everyone here shares your hopes that Pembridge recovers quickly.